What makes a family vacation memorable? The overall experience! Everything from the destination, accommodation, activities, and more is what will make your getaway one worth reminiscing on for years to come. Pinnacle Cabin Rentals understands this and is dedicated to not just providing Cabin rentals in Helen, GA, but a grand experience you won't soon forget. By offering some of the most beautiful, well-appointed, and romantic cabins rentals in Helen, GA! Many of our 35 unique cabins also boast amenities you won't find in nearby accommodations. Some selections invite you to relax in your own private cedar sauna while others promote family time with fun-filled game rooms. Our cabins feature some of the best accommodations that you won’t find at other Georgia cabin rentals. Pinnacle Cabin Rentals is also widely recognized for our unparalleled guest services. We are always available to you after-hours, stock your cabin with essentials such as soaps, and prepare for any special occasion you may be celebrating. We'll even stock your cabin's refrigerator with your favorite foods prior to your arrival! We aim to make your experience with Pinnacle Cabin Rentals exceed your expectations from the moment you arrive to the morning of checkout. From hundreds of hiking trails, national parks, stunning waterfalls, and an enchanting Bavarian village, Helen is a premier vacation destination. Recognized as the finest German-inspired town in the Southeast, Helen is a quaint and charming escape nestled within the beauty of the Blue Ridge Mountains. There is no limit to what you will discover in this peaceful region. Discover the tastes of the mountains at one of the many wineries and vineyards. Attend a fun-filled festival like the wildly popular Oktoberfest in Helen, GA. Immerse yourself in the Alpine wilderness during a hike along the Appalachian Trail. Exchange your vows before a stunning mountain backdrop at one of the many jaw-dropping wedding venues. No matter what you decide to do, boredom is not an option. Choose your perfect escape from our selection of cabin rentals in Helen, GA today! You may also browse through our free Vacation Guide for even more local activities and attractions. Our Beautiful Cabins in Helen GA Are Some of the Best in the Mountains. What makes a family vacation memorable? The overall experience! Everything from the destination, accommodation, activities, and more is what will make your getaway one worth reminiscing on for years to come. Pinnacle Cabin Rentals understands this and is dedicated to not just providing cabins in Helen, GA, but a grand experience you wont soon forget. How do we do this? By offering some of the most beautiful, well-appointed, and romantic cabins in Helen, GA! The mountain experience in our 45+ unique cabins wont be found in nearby accommodations. Some selections invite you to relax in your own private cedar sauna while others promote family time with fun-filled game rooms. Pinnacle Cabin Rentals is also widely recognized for our unparalleled guest services. We are always available to you after-hours, stock your cabin with essentials such as soaps, and prepare for any special occasion you may be celebrating. We aim to make your experience with Pinnacle Cabin Rentals exceed your expectations from the moment you arrive to the morning of checkout. Discover the Best of Helen in an Alpine Wonderland From hundreds of hiking trails, national parks, stunning waterfalls, and an enchanting Bavarian village, Helen is a premier vacation destination. Recognized as the finest German-inspired town in the Southeast, Helen is a quaint and charming escape nestled within the beauty of the Blue Ridge Mountains. There is no limit to what you will discover in this peaceful region. Discover the tastes of the mountains at one of the many wineries and vineyards. Attend a fun-filled festival like the wildly popular Oktoberfest in Helen, GA. Immerse yourself in the Alpine wilderness during a hike along the Appalachian Trail. Exchange your vows before a stunning mountain backdrop at one of the many jaw-dropping wedding venues. No matter what you decide to do, boredom is not an option. Choose your perfect escape from our selection of cabins in Helen, GA today! You may also browse through our free Vacation Guide for even more local activities and attractions. Our luxury cabin rentals in Helen and the surrounding area appeal to those looking for upscale accommodations, and an exceptional mountain experience! Our luxury couples cabins, with cotton spa robes, large jetted tubs in the master bedroom, and regulation size pool tables, are a great choice for anniversaries, honeymoons, or just a quiet getaway for the two of you! Our in-town cabins in Helen Georgia are perfect for those who want to be right in the heart of Alpine Helen. Many of our in-town cabins are walkable to Helen, or a very short ride to restaurants, shops, and all the activities that Helen has to offer! Our properties in Innsbruck Golf Resort offer the best of Alpine Helen Georgia. If youre looking for a new and challenging golf course, come and play Innsbruck Golf Club! The Sports Complex offers tennis courts for your use, with the community swimming pool open Memorial Day through Labor Day. Stay with Pinnacle and experience Innsbruck Golf Resort in Helen Georgia! Many of our cabins in Helen and the surrounding area offer access to lakes, ponds, rivers or streams. If you love the sound of a babbling brook or the rivers song, or just waking up to a peaceful lake or pond, you will love staying at one of our cabins with a water setting. We even have pet friendly cabins on water! Our mountain view cabins in Helen and surrounding area offer some of the best scenery this area has to offer. For many, its all about waking up in the mountains or looking out over our stunning mountain vistas. It will be hard to decide if you want gorgeous mountain views, or staying in a cabin right in the mountains! Whatever your choice, the best mountain cabins are found right here at Pinnacle Cabin Rentals! Our cabins in Helen with wooded views offer beautiful forest settings, with many offering privacy and seclusion. Many of our wooded view cabins in Helen and the surrounding area offer serene, quiet settings. Some cabins offer additional amenities such as access to walking and hiking trails, or seasonal mountain views. After a long day exploring the North Georgia Mountains, theres nothing quite like retiring to your own private cabin and enjoying a nice soak in the hot tub. Many of our luxury cabins in Helen, GA boast private hot tubs that are ideal for melting away all of your worries, soothing your tense muscles, and enjoying the spectacular mountain views. Browse our incredible Helen, GA rentals with a hot tub and be sure to book your favorite today! Of course, we also know you didnt come all the way here just to relax in the hot tub all day. After booking your cabin, be sure to download your free copy of our Helen Vacation Guide! Its filled with all the best recommendations for local activities and attractions including outdoor recreation, dining, shopping, entertainment, and much more. Whatever your interests may be, youll find a wide variety of exciting things to do within its pages. Enjoy the Best Family Game Night in These Beautiful Cabins. 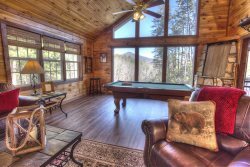 Challenge your friends and family to a game of pool or ping-pong in these fun cabins in Helen, GA! They also provide visitors with comfort, privacy, and a serene mountain setting. 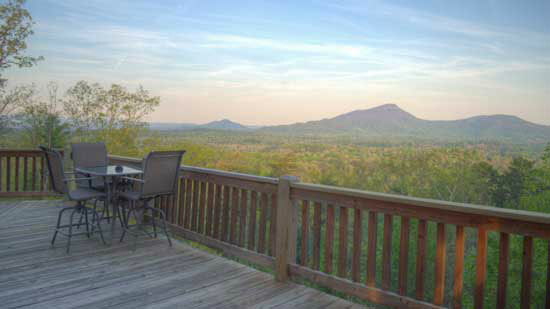 Find out how you can save on luxury cabins in Helen, GA with our incredible vacation specials. Our informative Vacation Guide is also a handy reference for all things to do and see in the Blue Ridge Mountains. Bring your pets with you during your Helen vacation! Pinnacle Cabin Rentals offers many pet friendly cabins in Helen, along with mountain, water, and wooded view cabins! We think our furry friends deserve the very best, and welcome them to any of our pet friendly properties! Find the perfect romantic couples cabin in Helen Georgia. Cabins for honeymoons, anniversaries or a romantic getaway to the mountains are all here at Pinnacle Cabin Rentals. We even have pet friendly couples cabins when you dont want to leave your fur baby behind! Find your perfect 2 bedroom cabin in Helen, Sautee Nacoochee, Clarkesville or Cleveland begins with a fully-equipped, deluxe vacation cabin. Approximately 80 miles north of Atlanta. Explore the mountains, vineyards, lakes and falls of the Georgia Mountains. Book online today or phone our office at (706) 754-2533. We have pet friendly and handicap friendly vacation rentals too. Our 3 bedroom cabins in Helen are great for families or small groups of friends. We have cabins in Helen, cabins with mountain views, cabins on water, and even pet friendly cabins. Bring the entire family and your fur babies on your next mountain getaway! Our larger cabins in Helen Georgia and surrounding areas are the perfect choice for larger families or groups! Many of our cabins are in proximity to each other, and offer a great choice for family reunions, wedding accommodations, or just getting the entire family together for the holidays or special occasion! Our 6-8 bedroom cabins in Helen are great for golf outings, wedding accommodations, family reunions, or even a corporate meeting! Our larger cabins are a great choice for large groups and families who want to be together under one roof!